Because the game is implemented on a diamond grid (this type of grid is also used in our isometric games), it gives us the possibility to have two directions for “gravity”. The AI is a simple one-move-ahead greedy algorithm. A grid with the same structure (but different data elements) is used for the look-ahead. The AI first looks if there are any next moves that make the computer win; then it looks for any moves that will make the player win (so that it can block them). 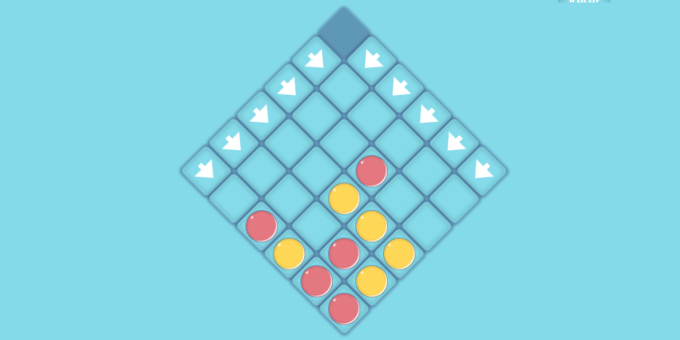 After this, it looks for moves that allows it to make a line of two; after this it looks for a move the player can make to get a line of two (again, to block it). Finally, if no good moves have been found, it makes a random move.